The biceps tendon originates from the top of the shoulder socket (the glenoid) and exits through a bony depression known as the biceps groove. Below the shoulder, the tendon becomes the long head of the biceps muscle; thus, the biceps muscle, which functions to flex the elbow and rotate the forearm, is anchored in the shoulder region. Injuries to the biceps tendon can come in two varieties: partial and full thickness or complete tears. Most tears of the tendon are the result of continuous or repetitive strain. In the younger population, tears are often seen during heavy resistance training. In most cases, tearing is a gradual process, and partial tears are a source of continued pain. 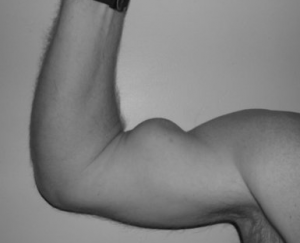 If the tear is a complete tear in the proximal tendon (near the shoulder), the bicep muscle may roll down and form a muscular ball, known as a “Popeye sign" (image). 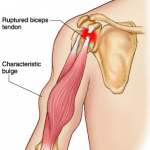 Symptoms of a full biceps tendon tear include sharp, sudden pain in the upper arm, and in some cases, an audible pop or snap. Symptoms may also include pain or tenderness near the shoulder, difficulty flexing the elbow and rotating the forearm. For those who have a painful partial tear in the tendon, treatment includes rest, ice, anti-inflammatories and physical therapy to help restore muscular strength and flexibility. Surgical treatment, known as a biceps tenodesis, is an option for those who do not have relief or improvement from conservative methods. Several new, procedures have been developed to repair the tendon in a minimally invasive fashion. The goal of the surgery is to re-attach the tendon to the bone. 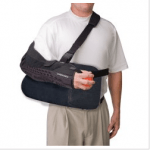 At the level of the shoulder, the biceps tendon will usually be reattached or anchored to the proximal humerus using a small screw and suture.